Compact & lightweighted, the model: Samples will make it very easy to make beats. Thanks to the lovely hands-on approach. Model: A sample-based groovebox with six tracks, a lot of power and i twill fit in your backpack. Model will be available with some patches and presets of a professional quality. Just to get you started. It has enough space built in for your own creations. The soundboard uses high quality, digital samples. There are 300 pre-installed sounds by splice. Categorized by kicks, hihats, and even sounds that are never heard before. With a few changes, you can modify a sample till it reaches your needs. Import your own samples or use one of these custom sound packs. 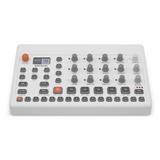 Elektron Model makes it possible to have one function/knob. All well designed on the frontpanel. One turn will change any sound. Music will breaks free with 6 hard-touchsensitive pads. Every move will be recorded in the Elektron Sequencer. Ready to go? With a device of less than one kilo? You’ll get all the advantages of one light and handy machine with some surprising sonical power and sound.